For the first time in my life, I am on the West Coast of Canada, enjoying the casual Vancouver life. I’ve been indulging in delicious seafood, and it reminded me of one of my favourite seafood salads. 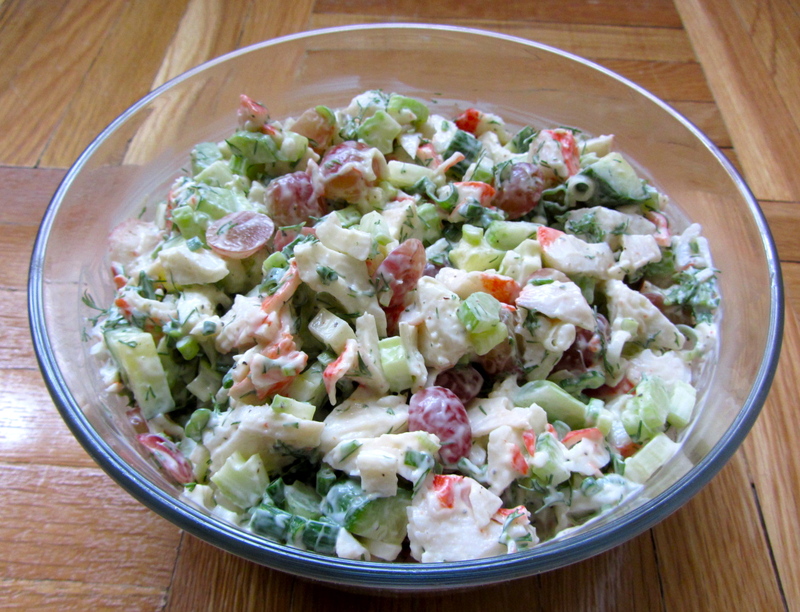 This salad is the very essence of fresh – the cool cucumber and green melon accents the crab meat perfectly. The mayonnaise dressing is lightened with lemon and dill, making the seafood shine. This is one of my favourite salads to enjoy as it’s simultaneously light and refreshing, while filling. I can’t take credit for this salad – that goes to my mom a few decades ago who had the brilliant idea of substituting imitation crab meat for chicken in a Silver Palate recipe. It’s been a family favourite ever since, often the star during a picnic lunch. The salad keeps well undressed for a few days in the fridge – so if it’s just me enjoying it, I’ll dress individual portions as I eat them to help it hold. To make it a meal, serve with a crusty roll and enjoy! In a small bowl, combine the mayonnaise, lemon juice and zest, and seasoning until thoroughly mixed. Shred the imitation crab meat into bite-size pieces and place into a large bowl. Add the melon and cucumber balls, grapes, green onions, and dill. Fold the mayonnaise mixture into the salad. Adjust seasoning to taste. Best served cold. With the sun shining and the temperature soaring into the high 20s, it’s hard to believe its already Fall. I love the changing of the seasons, especially when the weather is so mellow. As the sun glistens on my bike ride home, I soak in the rays while admiring the leaves starting to turns. Even better, the farmer’s markets are bustling, bursting with produce. 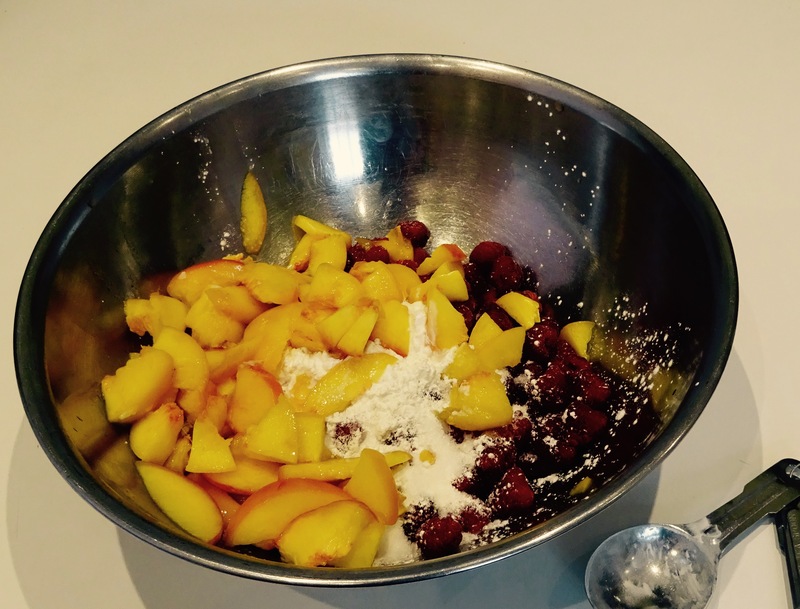 Who doesn’t love peaches and raspberries? I’ve been home visiting my parents, and this past weekend we celebrated my mother’s birthday. 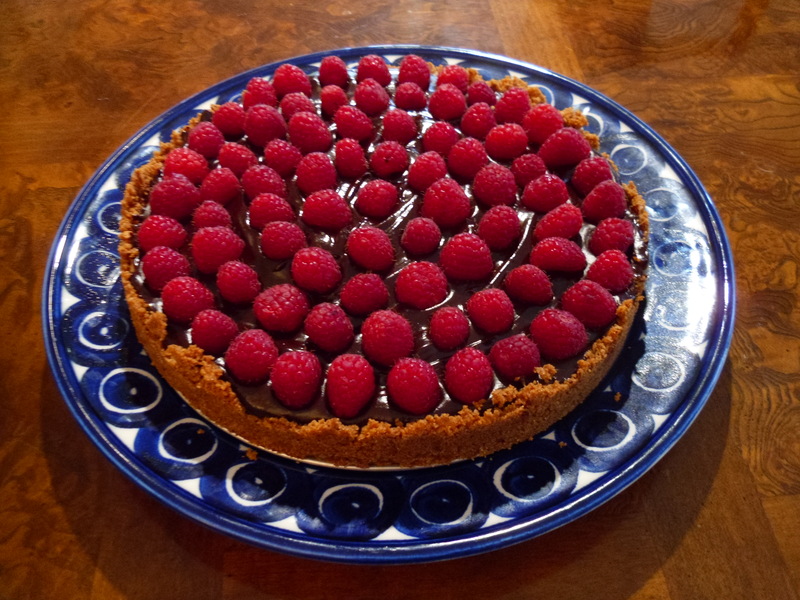 She is a raspberry addict, so her birthday dessert just had to have an infusion of raspberries. We had a beautiful basket of peaches that were perfectly ripe and also needed eating, so I decided to combine the two for a special treat. 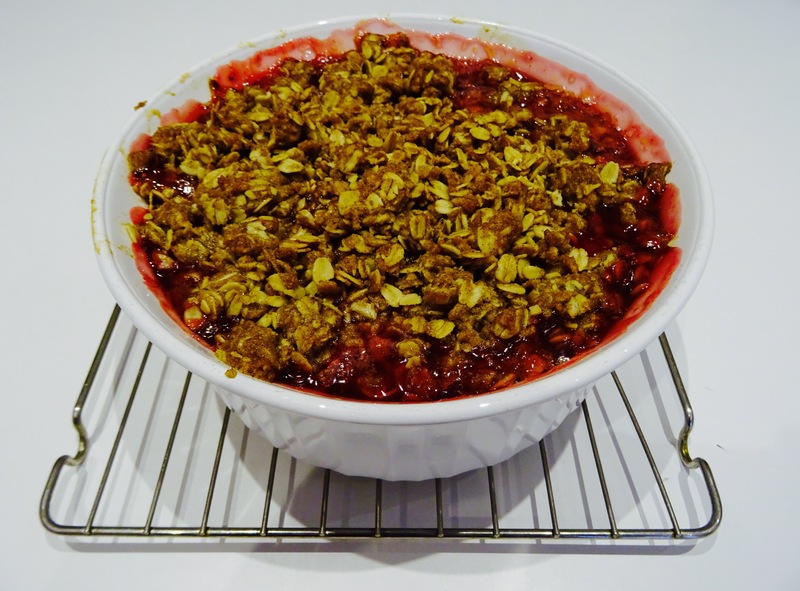 I happened upon a recipe for raspberry peach crisp from Averie Cooks and it seemed like the perfect choice to combine the peaches and raspberries for our celebration. The crisp itself was delicious, full of bold flavours that complimented rather than overwhelmed each other. The raspberries’ tartness stood out beautifully with the smooth peaches, a delicious combination I’ll most certainly have to try again! I loved the fresh flavours along with the ease of assembling – it took a mere 10 to 15 minutes. 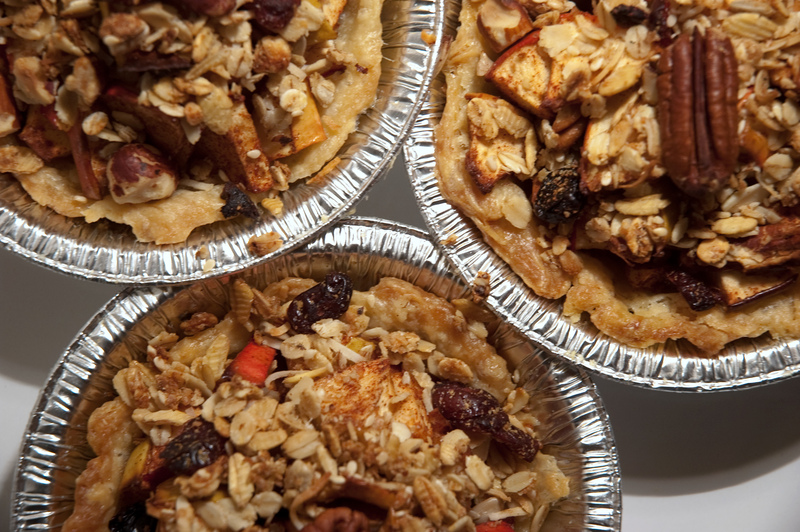 And who doesn’t love a crispy oatmeal topping? Preheat oven to 350F. Grease a 9-inch pie dish. For the crumble topping: Place the brown sugar, oats, flour, cinnamon, and salt in a bowl. Use a pastry cutter or your fingers to cut the butter into the dry ingredients until small pea-sized clumps form. Sprinkle the crumble on top of the fruit filling. Place pie dish on a cookie sheet (in case there’s an overflow as it’s cooking) and bake for about 40 to 45 minutes, or until bubbly. 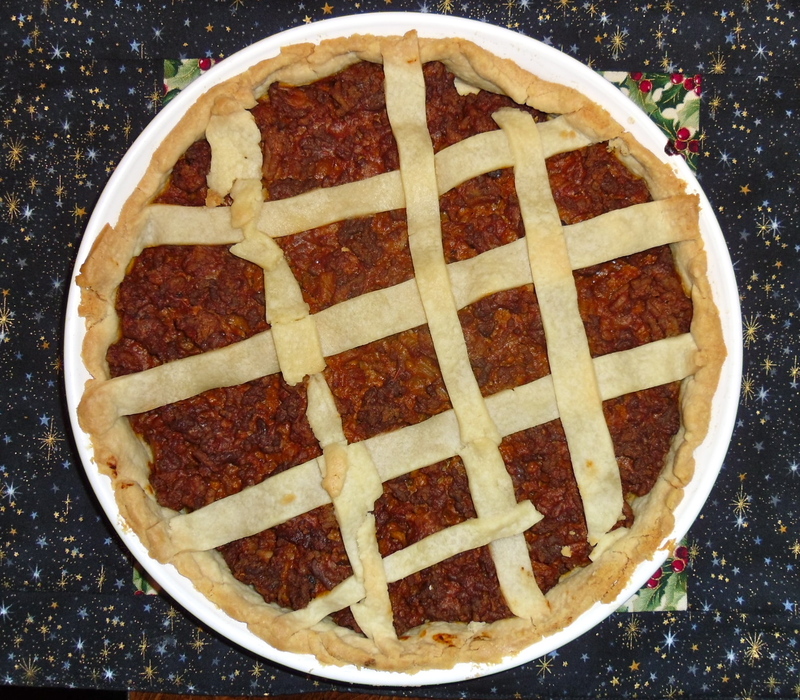 Crisp is ready when it is bubbling vigorously along the edges of the pie plate and the topping is golden browned. Cool on a wire rack. Serve warm or cold with ice cream or whipped cream. My grandmother recently turned 90! To celebrate her birthday, we held a luncheon that included this salad. A recipe from the now-defunct magazine Gourmet, this salad is simply lovely. The dressing is the star – creamy and with just a hint of sweetness, the kick of the curry and ginger makes this dish shine. I also love how the dressing is not too heavy, lightened by the yoghurt. The chicken is gently poached, ensuring that it stays nice and moist. And the tanginess of the red grapes and mangoes compliment the saltiness of the cashews. You simply can’t go wrong with this one! If you plan to assemble ahead, hold back the cashews and add at the last minute. Otherwise they will lose their crunch. As an aside – if you happen to have curried mayo leftover from sweet potato fries, this is a delicious way to use it up! Combine chicken broth with 4 cups of water in a large saucepan and bring to a simmer. Add chicken and simmer, uncovered, for 6 minutes. Remove pan from heat and cover, then let stand until chicken is cooked through, about 15 minutes. Transfer chicken to a plate and cool for 10 minutes. Chop into 1/2-inch cubes. While chicken is cooling, whisk together mayonnaise, yogurt, curry, lime juice and zest, honey, ginger, salt and pepper in a large bowl. Add chicken, onion, mango, grapes, and cashews. Stir gently to combine. 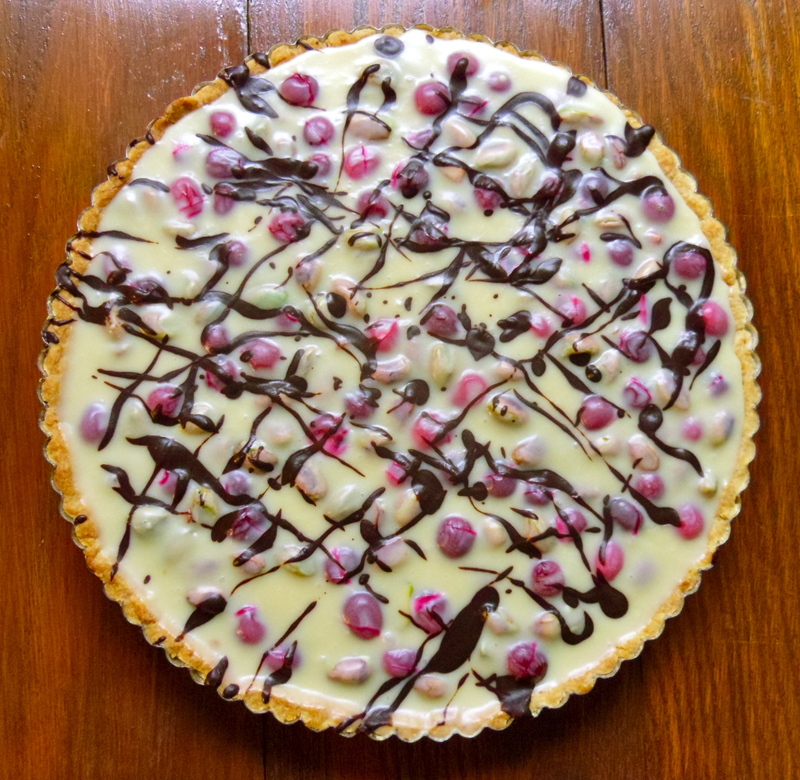 To accompany the cranberry sauce post I did a few days ago, here’s the recipe for an absolutely divine cheesecake we made for a dinner party last night. G. has been coaching boy’s volleyball, and last weekend he brought a big bag of his home-made chocolate chip cookies along for the team. They loved the cookies apparently, but the poor quality of the flour meant that before the boys managed to eat all of them many had disintegrated. He came home and announced we must make a cheesecake to use up the crumbs. Yes! Warning! Bake this cake in the morning – it requires a lot of cooking and cooling and rest before you can serve it to your guests or bring it to a dinner party. It’s well worth the effort though, I promise. It’s lighter than many cheesecakes, and the nuts in the crust along with the browned butter make it absolutely irresistible. In a saucepan, melt butter over medium-low heat. Once it is melted, allow it to begin to bubble. Reduce the heat and watch it carefully until the bubbles start to get bigger and then smaller. Once they are tiny and look foamy, keep your eye out for little golden and then light brown specks in the butter. Remove it from heat immediately as the butter is now at the browned butter stage which is delicious as it tastes like hazelnuts but it can easily be burned. If you like you can keep a shallow pan of cold water next to your stove and when the butter is browned you can dip the bottom of the pan in order to kill the cooking process and protect your butter from burning. Mix the cookie crumbs along with the brown sugar, and then pour the butter over that whole mixture. Mix well, and then press into a round, 2 1/2 inch deep springform pan (ideal… we don’t have anything of the sort though and managed well enough). Press the bottom and sides up to form an even crust. 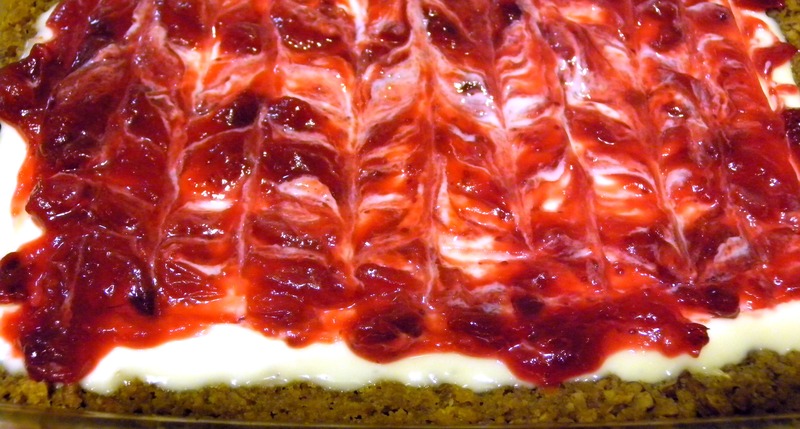 Chill in the refrigerator for 30 minutes while you process the first layer of cheesecake. Remove the cream cheese from the fridge so it can soften a bit, as with the eggs. Next, preheat the oven to 375F. Whisk all the ingredients for the first layer together, except the cinnamon. If you have a food processor, process them together. If not, as is the case with us, you can press it through a sieve several times with a spoon and that does the job too although it is a bit messier! 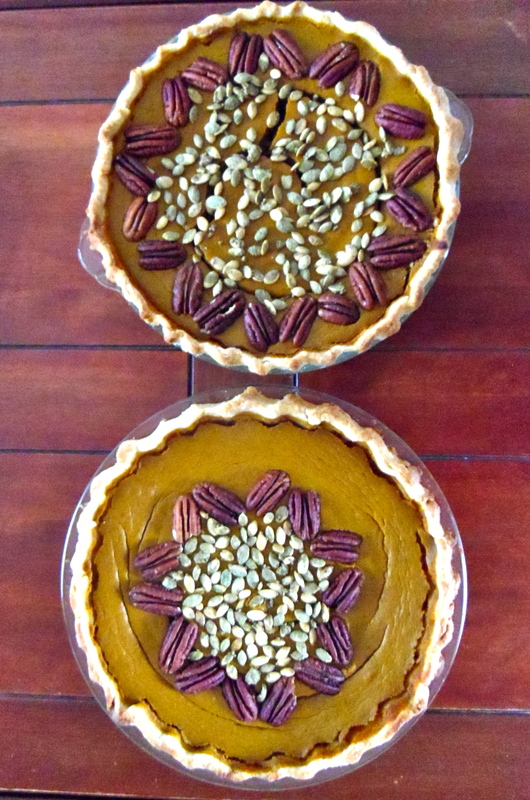 Spoon that into the crust and bake for 20-22 minutes. When it is cooked remove it from the oven and let it cool to room temperature. This takes several hours. Sprinkle the cinnamon over top of the first layer. To make the second layer, preheat the oven to 425F. Mix the ingredients for the second layer thoroughly. Pour it all over the first layer. When the oven is ready, cook for five minutes. Remove from oven and allow to cool first to room temperature and then to chill thoroughly in the fridge for at least 6 hours before it is ready to be served. 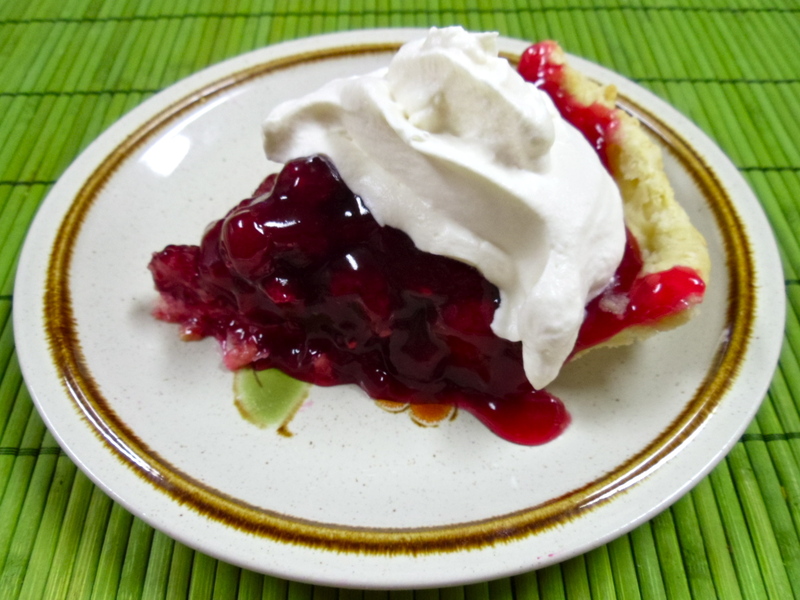 Before serving, prepare spirited cranberry sauce, and drizzle over top. Just this fall, I have made endless desserts with apples – and I have been challenging myself to make a different one each time. The most difficult thing about that is the fact that most of the time I only have a short period of time in which to make these, so inevitably, that reduces the scope possibilities. Despite this, leafing through cookbooks and fellow foodblogs, I have managed to keep it relatively creative. 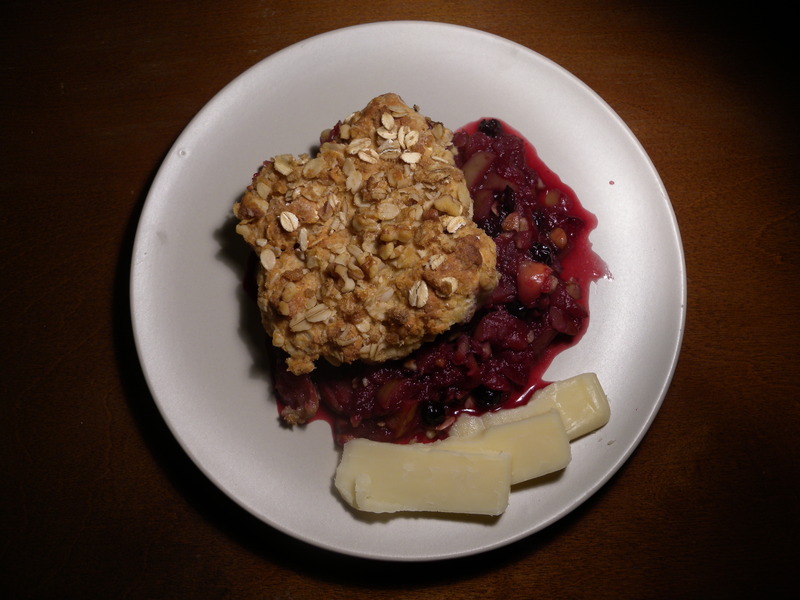 I made this recipe with apples that were picked off a tree and wild blueberries from the Byward Market in Ottawa. What a delight! The great thing about this cobbler is that it is versatile and can be consumed for breakfast, snack, or dessert! Preheat oven to 375F. In a bowl, mix the flour, baking powder, salt, and oats together. Cut butter into flour mixture until small lumps remain. In a separate bowl, mix maple syrup or honey with egg. Pour into flour mixture, and quickly form into a ball. Cover and refrigerate while you cut the fruit. Core and cut the apples into small pieces. In a bowl, toss the apples with the lemon juice. Add the blueberries, and then the flour, brown sugar, nuts, and spices. Toss until the entire mixture is covered. Lightly grease a deep 8-inch square baking dish (I often use casserole dishes). Place fruit inside. Divide the dough into several pieces (I like to do 5), and flatten them with the palm of your hand. Place one in each corner of the pan and one in the middle – most of the fruit should be covered. Now, lightly brush the milk or cream on top of the crust, and then sprinkle the whole top with the cardamom sugar. This recipe is absolutely delicious with vanilla yogurt, frozen yogurt, or ice cream! 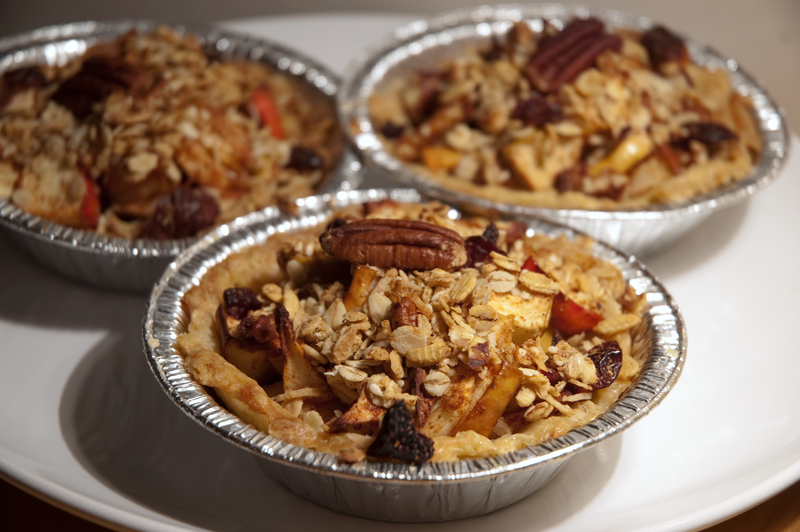 Or, if you haven’t tried apple-based desserts with a slice of sharp cheddar, this might just be the time.